Separating fava beans from their seedpods. Photo © Melody Overstreet. I make it a daily practice to walk the garden and check-in on the plants. With each hot day that passes, I find that there is always something new that surfaces. The birds come to land on the branches of the fig tree, while others land in the avocado tree and settle into the bottle brush. Pollinators buzz throughout, feasting on all that abounds. Evidence of their presence is visible through the various plants that signify transition. Faded blossoms begin to drop, and in their place seeds begin to expand and form. Being a witness to this process always fills me with a great sense of wonder and awe. 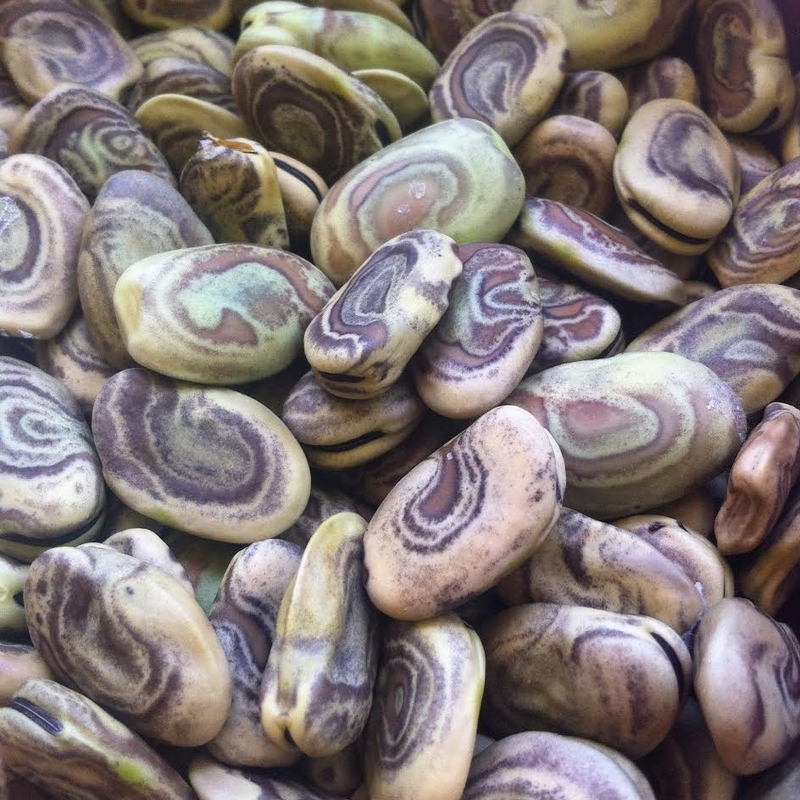 Two years ago, we received 10 fava beans from our dear friends. The seeds originated from the Sacred Valley region of Peru where they were hand-selected for a distinct spiral pattern on the seed coat. Starting with just a few seeds, we decided to grow this plant out in our urban garden in Midtown Santa Cruz. After successful plantings, I gently gathered these the dried pods of the newly formed fava beans. Here is a close-up of the seeds I saved. The pattern reminds me of finger prints or various topographic layers across a landscape. Photo © Melody Overstreet. 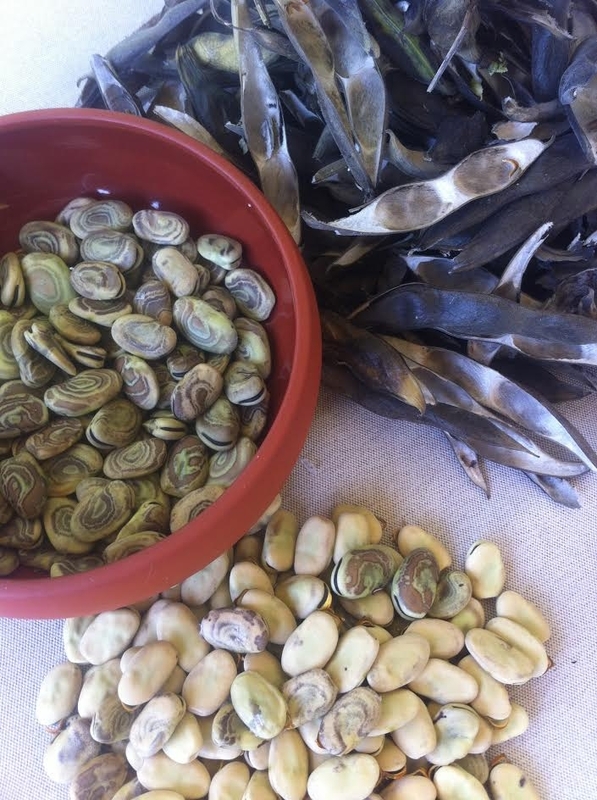 I began by removing the fava beans from their seedpods. I then separated the seeds with the distinct spiral pattern from the ones with solid seed coats. I will save the seeds with the patterned seed coat for future plantings, and utilize the seeds with the plain seed coats for food. The spicy mustard greens that generously fed us over the late winter and spring season have also since gone to seed. I harvested the seed heads and set them to dry on a large repurposed bed sheet. When fully dry, I will gently stomp on these seedpods, and sift them through fine screens to separate the seed from the chaff. The plants that did particularly well in our bioregion are the ones that we save. Over time, seed that is hand-selected in a place can become well adapted to the environmental conditions of that specific location. There are many features to save seed for, including taste, size, texture, color, drought resistance, disease resistance and overall health. 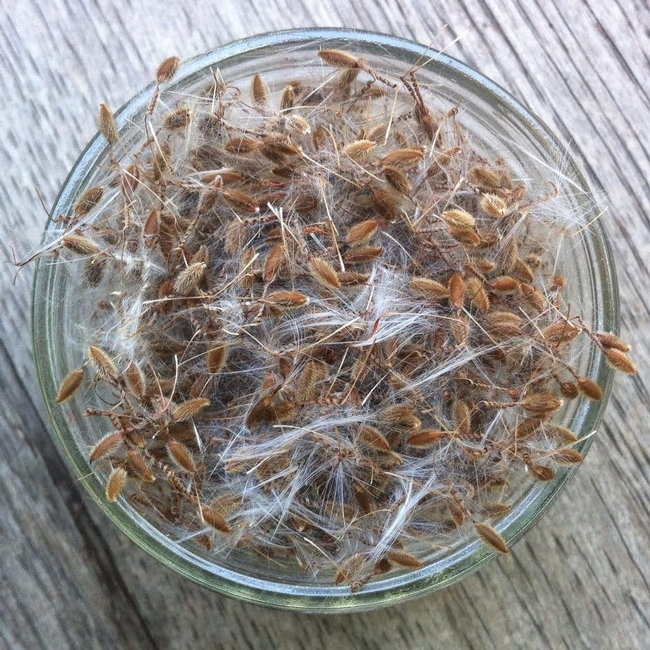 Newly gathered rose geranium seeds -- a delight to harvest, as the whole plant smells akin to rose! Photo © Melody Overstreet. After gathering seed, I begin by sifting out any unnecessary plant matter. I compost any remaining plant matter, leaving only the winnowed seed for storage. This helps maintain integrity of the seed, as seeds stored with excess plant matter have a shorter shelf life and have a greater tendency to rot. Depending on the seed I am saving, I make use of a series of seed sifting screens, or winnow the seeds using wind (or my breath) and a basket. When dry and ready, you can begin storing your seed. Seed is well kept in a glass jar. Be sure to label each jar with the name of the plant, the date in which you collected the seed, and the location the seed was collected from. Keep in mind that seeds are living! It is best to store your seeds in a cool, dry, dark/shady space away from sunlight. Seeds saved in paper envelopes to share with others. Photo © Melody Overstreet. From repeated observation, we note that from one seed comes many. When I have an abundance, I love to share bio-regionally adapted seeds with neighbors and friends, knowing they may be more empowered to grow their own food, medicine, or tend to native plant habitats, all while providing a sanctuary for the many diverse pollinators of our region and world. 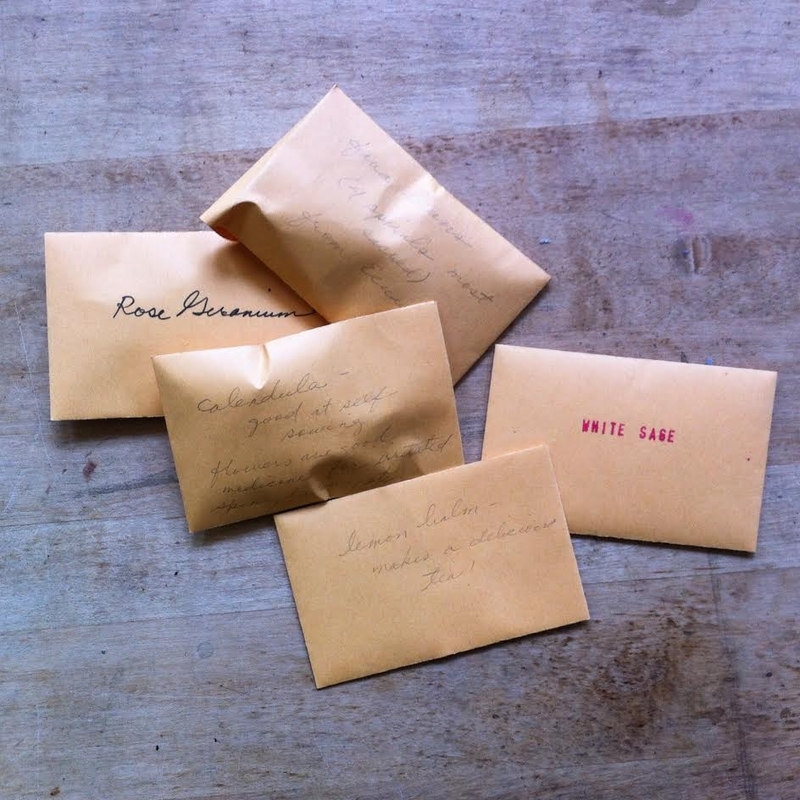 Have you inherited any seeds with an interesting story? What is blooming or going to seed in your garden at this time? To read more about saving vegetables seeds, check out this blog post.